I’m excited to participate in this blog hop with My Favorite Things! My card features flowers and leaves cut using MFT Die-namics Prima Donna Petals from Gauze that was stiffened with Art Medium. I sponged Blueberry and Coral Crush Hybrid inks onto gauze before cutting. I love the sheerness of these flowers! The dimensional centers are Dodz Adhesive Dots 3D with Spills Prills. They are the perfect color to coordinate with patterned papers from Subtle Plaids and Gingham Homespun Paper Packs. I’ve added an accent strip of Ash Tissue Tape with piece of Twine alongside it. 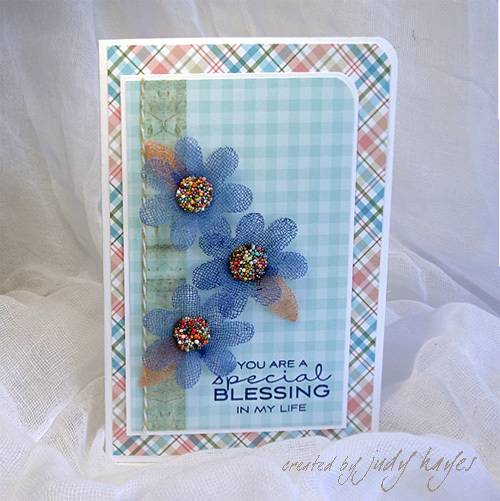 The verse is from LJD Cheerful Blessings and stamped with Blueberry Hybrid ink. For more details on Judy’s blog, please click: Designs by Judy Hayes. So excited to be a part of this blog hop and I hope everyone is enjoying what has been shared so far! 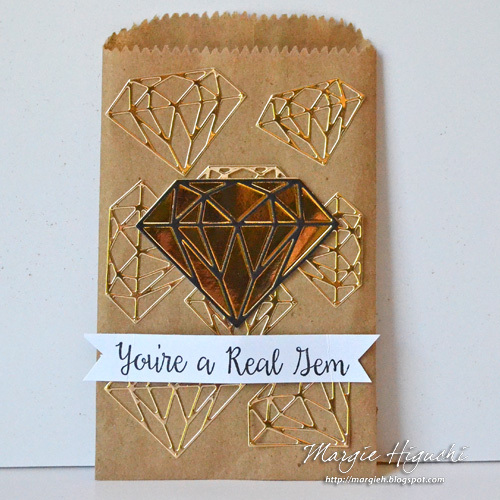 Using Adhesive Sheets 4 x 6″ and Die-namics Diamonds set, I created my background for my gift bag. So simple – place the sheet on the back of my mirror gold cardstock and die-cut! Doesn’t damage the cutting ridges of the dies. For dimension, I cut the largest Diamond on 3D Foam Creative Sheets and placed a black diamond die cut on top. Placed on top of the embellished bag front. I stamp a sentiment from Bling It On stamp set in black ink on white cardstock and cut a ribbon-tail banner shape around it. Using Dodz Adhesive Dots Medium, I adhered it at the bottom. Add some rock candy and it’s ready to give! For this blog hop I was inspired by the great materials from MFT with their beautiful stamps, stencil and patterned papers, along with wonderful products from Scrapbook Adhesives by 3L® to create some flower power projects! My first project was this cute little album. I used the Sweet Tooth Cardstock Paper from MFT as my base and stamped with the LJD Peaceful Wildflowers on it. I also used the LJD Wildflowers Stencil on the background by outline it with a black pen. For the pinky flowers I used the stencil and spray paint and then I gave them a black outline to cut them out. I adhered the flowers with the E-Z Dots® Permanent Refillable and some small 3D Foam Squares Mix White to create a 3D effect. My inner pages are papers from the Off the Grid paper pack. I folded them and bound it all together with the pink Twine and a big needle. Then I made some little cards with messages I got from the stamp set LJD peaceful Wildflowers. I so loved it to make them. Those cards are great to give away. 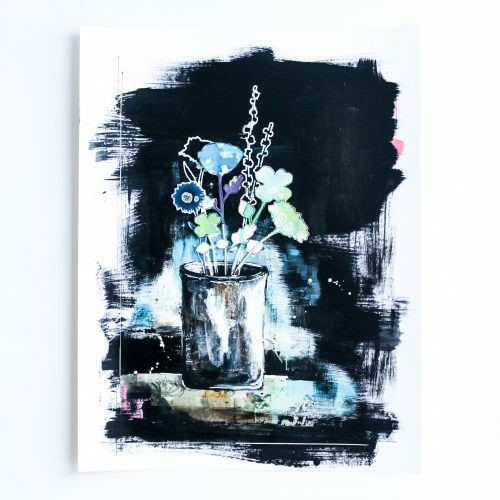 And then I had fun to paint a vase on a Sweet Tooth Cardstock Paper. For the background I also used the Tissue Tape – Flower and Ash. I used the stamps and the stencil for the flowers and cut them out. I adhered them on my painted vase with E-Z Dots® Permanent Refillable and some small 3D Foam Squares Mix White. Don’t forget to hop over to our friends at MFT by clicking: Blog Hop with MFT – Day 3. This entry was posted in Adhesives, Announcement, Cards, Crafts & Tutorials, E-Z Runner® Dispensers, Mini Albums, Mixed Media and tagged 3D Foam Creative Embellishment Kit with Foil, 3D Foam Creative Sheets Mix, 3D Foam Squares Mix White, Adhesive Dots 3D, Adhesive Dots Medium, Adhesive Sheets 12x12" (25 sheets), Adhesive Sheets 12x12" (5 sheets), Adhesive Sheets 4x6", Adhesive Sheets 6x12", Art Medium, Bakers Twine, Blog Hop, Card, Cheesecloth, E-Z Dots Permanent Refill, E-Z Dots Permanent Refillable, E-Z Dots Refill Value Pack, E-Z Runner Grand Permanent Dots Refill, Gift Bag, Judy Hayes, Margie Higuchi, Mini Album, Mixed Media, My Favorite Things, Paint, Stephanie Schutze, Tissue Tape Ash and Oak, Tissue Tape Denim and Flowers. Bookmark the permalink. 41 Responses to "Blog Hop with My Favorite Things (MFT) – Day 3"
Thanks for the three days of fun and inspiration! This has been a fun blog hop. I’ve enjoyed the beautiful inspiration and learning about products I’ve not seen. My favorite is discovering new products, especially stencils. WOW! blown away by the projects showcased here, each one featuring an outstanding pairing of each company’s products! My favourite part of blog hops….the incredible creativity revealed when designers use similar products/elements/techniques in diverse ways. I always come away inspired (and with a wish list *grin*) Thank you for sharing beauty today! Wow… Some Frear projects and inspiring ones. I love the new adhesives and will have to get some. Thanks for all the great inspiration! I enjoyed this collaboration! Awesome cards today! My favorite is Judy’s cute flowered card. I love the design & those gorgeous sheer flowers! All the projects are so great that it was really hard to pick a favorite. Lots of great inspiration here!! Great card samples. What talent you have. I love your products. MFT sent me. Thanks for the chance to win. Beautiful inspiration today, thanks! I love the gauze flowers & petals on Judy’s card, gorgeous! Will have to put that on my wish list to make. MFT sent me! Thanks for chance to win and the fab inspirations. 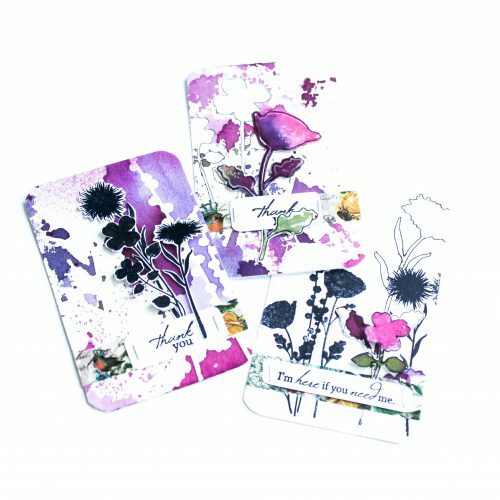 The creations with MFT’s wildflower series is especially breathtaking! My fave is seeing a product being used by so many talented gals and all the different ways they use them! I don’t think I could choose a favorite today if my life depended on it!! They are all magnificent and breathtaking!! Margi’s bag has a slight edge over the rest as my favorite!! LOVELOVELOVE!! TFS! This has been an amazing 3 day hop! Thanks for having me along! Beautiful work and thanks for the inspiration! Lots of fabulous ideas and inspiration with this fun match up! Great products from Scrapbook Adhesives and MFT for creating so many delightful cards and projects! Love the projects today and what a great blog hop with 2 great companies!!! Ok, now I’m definitely sold on those adhesive sheets! I can’t wait to try them! All very awesome projects…I am especially in love with that first card!! Wow! So creative and beautiful! 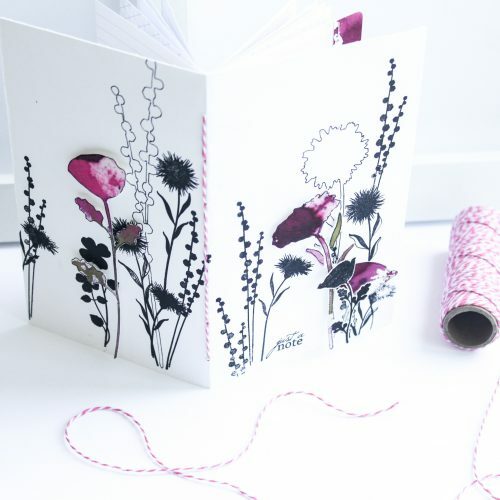 I love how Stephanie used the Wild flowers, gorgeous makes! Love the gauze flowers. Have to try that sometime. The gold on the next project is fabulous. thanks for hopping with MFT. Beautiful projects! So many great ideas. Fabulous projects. My fave is the first card. Wow, Wow, Wow! Great hop and great projects! Really stunning!!! I love the gauze flowers and dimensional centers! Oh my GOSH GOLLY – all of these projects are completely beautiful and so awesome!!! Love that first card with those pretty flowers – oh, what a treat!!! What incredible projects!! My favourite thing about the hop is all the inspiration and ideas you are giving us, things I would never think of myself!! Wowzers! These projects really outdid themselves!! Bookmarking for future ideas… love that about hops!! WOW!!! Amazing projects with both companies’ products. I LOVE LOVE LOVE those foiled cards. My favorite part of blog hops are all the wonderful projects and ideas shared by the participants. It always makes me want to hole up in my craft room and have fun! These were all just awesome. The Girlie Grunge line is new to me, so I’ll be checking that out. Thanks for joining with MFT- Y’all rocked it. Oh wow! I’m so happy to be one of the lucky winner of your hop! I’m so excited to try and play with your amazing goodies!!! This is one of the best birthday gift that I’ve never received!!!! Thank you again!